Earlier this year, Barcelona, Spain played host to the four-day Mobile World Congress. Reflecting the increasing impact mobile technology is having in our lives, the event was supported by some 2,000 companies and 85,000 professionals, and featured keynote speeches by such luminaries as Facebook founder Mark Zuckerberg and Chairman of the U.S. Federal Communications Commission, Tom Wheeler. Events like the World Congress are bellwethers to the future of technology and a clear illustration that mobile has come of age. The rapid growth of smartphone and tablet sales has been the driving force behind the mobile market as more customers have come to appreciate the convenience and immediacy of using apps for their information needs. And that has, itself, spawned a whole new way retailers are interacting with their customers. 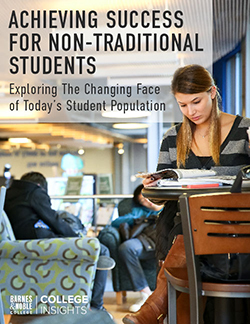 Barnes & Noble Colleges’ bookstore mobile app rolled out system-wide earlier this year after initial testing at 130 separate college locations. Available for both Apple and Android devices, the app is seen as a key extension to the services provided by the campus bookstore. “Our primary focus in the design and development of the app has been customer service,” explains Tamara Vostok, Barnes & Noble College’s Director of Consumer Marketing. “We wanted to provide a convenient mobile platform where students could check and track all of their orders, or receive reminders on rental books at any time — even when they’re on the move,” she says. 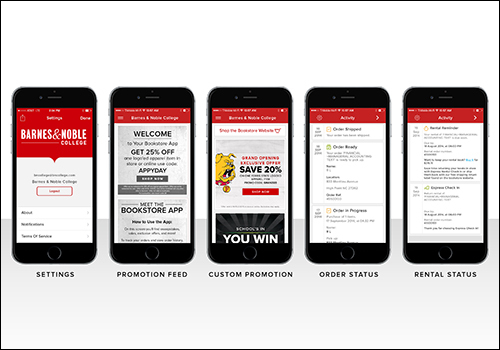 The bookstore mobile app is customized for each campus bookstore and provides convenient rental reminders, order status tracking, exclusive offers and more. The app will also provide notifications of sales, or special events in the store, and extend exclusive offers and discounts for the mobile users. Rather than working in isolation to the brick-and-mortar bookstore, Vostok believes the app fits perfectly into the way millennials shop and positions the campus retailer firmly on the cutting edge of how those preferences are changing the retail experience. “Usage of mobile apps are so high among students — 98 percent of our customers have smart phones, and many of our campus partners are using or developing their own apps,” she explains. 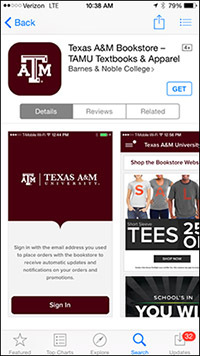 At Texas A&M University, the student app was launched as a seamless addition to complement the campus bookstore, featuring branding to reflect the school’s colors and logo. “We tested it in the first semester, and in the roll-out, we wanted to focus our students on the really strong benefits it provides,” explains the store’s General Manager, Holley Scott. 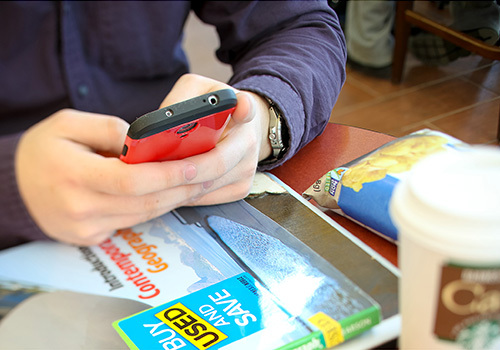 One of those benefits, Scott believes, is the way the app further simplifies the textbook rental process. “It can sometimes seem complicated or intimidating, and throughout the school year, our students can often forget which titles they’ve rented or when they’re due to be returned. Rather than just being another app on their phones, we wanted to ensure they could understand they could now access all of that information in one convenient place,” she says. Scott has sign packages all over her two-story store, but also encourages her staff to talk about the app at the register. “We’re asking everyone to take a few extra moments to talk about the app’s features and how we can now send reminders and communicate with our students to help them better manage their textbook rentals,” she says. The store has also created bookmarks, which explain basic information about the refund policy for rentals and when they’re due, along with an overview of the app information. 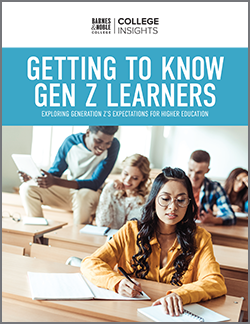 Forecasters expect that smartphone growth will continue, along with increased sales of tablet devices, and that could point to a new generation of students with even stronger preferences for receiving information through apps on mobile devices. As she plots the future development of the student app, Barnes & Noble College’s Vostok doesn’t see any immediate limit to mobile technology. “There is just so much potential, so much more opportunity to reach our students and provide them with better information on different platforms,” she says, adding that she’s hoping a future development for the app might be to include more social elements in the feature set. how can I contact a live human regarding an incorrect order i placed? We apologize for not getting back to you sooner. What college bookstore did you order from?